Transporting your specialized cargo via trucking, is one of Access World Logistic Corporation’s strengths. Importers and producers of construction and manufacturing machinery into and out of the United States, Canada, and Mexico can count on AWL to provide the expertise and equipment to get the job done safely, on schedule and at a competitive price. Because of the variance in oversize and overweight regulations from state to state, we take extra care to make sure each state approved route is double checked for accuracy before the load ever moves. For extremely heavy cargo, we provide multi-axle trailers and dual lane transporters which can handle up to 400,000 lbs. 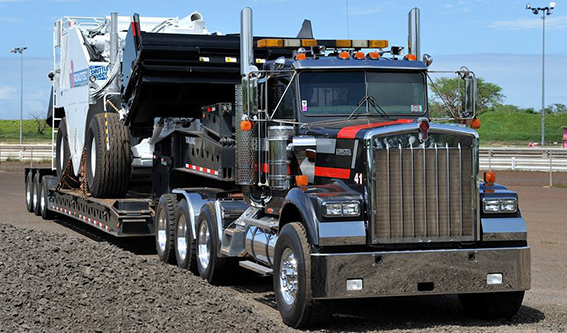 Let our heavy haul experts provide you with a comprehensive plan for your oversize / overweight loads. Construction and mining machinery, pressure vessels, press machines, transformers, circuit breakers and agricultural machinery are products we transport on a regular basis. AWL Corp is highly experienced in offering flatbed, dry van, and less than load trucking transport throughout the US, Canada, and Mexico. We will provide you with accurate information regarding the location of your load at all times, and ensure that it arrives at the desired location in a timely fashion. AWL Corp possesses the experience to transport and to obtain the necessary licenses & permits for transporting sensitive cargo. We know that sensitive cargo requires specialized handling during loading and transport. We have the expertise to ensure that your cargo is handled correctly with exceptional care from loading to off-loading. Your loads entrusted with AWL Corp will be handled in a secure manner. We will work with you to ensure that your cargo is safely delivered to the desired destination. Simply by their definition, high-value and sensitive goods are the types of merchandise that require some degree of special consideration and handling during all phases of the delivery process – loading, in transit, and off-loading. We recognize the importance of securing and protecting every shipment that is entrusted to AWL Corp, and we apply exceptional care and extra precautions for shipments that contain delicate components and/or have high-value price tags.Transporting your specialized cargo via trucking, is one of Access World Logistic Corporation’s strengths. Importers and producers of construction and manufacturing machinery into and out of the United States, Canada, and Mexico can count on AWL to provide the expertise and equipment to get the job done safely, on schedule and at a competitive price. Because of the variance in oversize and overweight regulations from state to state, we take extra care to make sure each state approved route is double checked for accuracy before the load ever moves.AWL Corp possesses the experience to transport and to obtain the necessary licenses & permits for transporting sensitive cargo. We know that sensitive cargo requires specialized handling during loading and transport. We have the expertise to ensure that your cargo is handled correctly with exceptional care from loading to off-loading. Your loads entrusted with AWL Corp will be handled in a secure manner. We will work with you to ensure that your cargo is safely delivered to the desired destination.